Many people pick January 1st as the day to open their new online Antiques business. Unfortunately, more than half of them close this same business before June rolls around, citing no sales or high expenses as the reasons. Somehow the “I’m going to make a million dollars in 3 months on the internet” mentality is still alive and well. But the real reason these businesses fail is because the owners didn’t do their homework before they opened shop, and then they stopped doing any work once they did. You wouldn’t open a brick and mortar store and work one day a month and expect to make money, so why approach a cyber store with the same attitude? Online businesses will work if you work them. Here’s a few hints to make yours a success. Know your merchandise. Don’t sell glass if you’re a furniture expert. Play to your strengths. Decide what you’d like to specialize in, then get every book you can find on the subject and study! Educate yourself about the history of your items, the selling prices, reproductions that may be out there, and how condition affects price & desirability. Successful online Antiques businesses are run by people who know about their wares and are always looking to learn more. Know your venue. Like brick and mortar stores, online Antiques malls have reputations and established clientele. Before you open your site, check out what’s being sold by other dealers in that online mall. Your Victorian mantle lustres will be ignored on a site where comic books and vintage toys are the hot items. You should also check the ‘about us’ section of the site to learn how long they’ve been around, who owns them, how many dealers they have, etc. Finally, ask the dealers who sell the type of items you’re looking to sell if they’ve had good results. Advertise. Once you open your site, make your presence known. Take advantage of advertising available within the mall such as mailing lists, bulletin boards, press releases, and paid feature ads. Submit your site to every search engine you can think of, and buy keyword advertising. Join online fan groups, study groups, and chat boards that feature your type of merchandise, then get your site listed – even if you have to PAY to be added to their list. Don’t nickel and dime your online business to death. You have to spend money to make money. Commit to your business. If you open your online antique business with the attitude, “I’m going to give this 6 months and if I haven’t made money, then I’m out,” then don’t bother opening at all. You wouldn’t put such limitations on a brick and mortar store, so why do it to your cyber store? 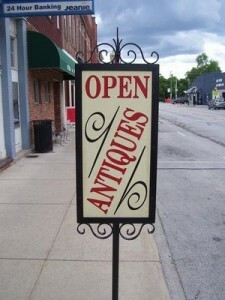 Every antique store – whether cyber or tangible –requires hard work, dedication, and perseverance. If you commit to doing whatever it takes to make your business a success, then you will succeed.